SpacePenguin earned the First Anniversary badge. SpacePenguin earned the Second Anniversary badge. SpacePenguin earned the Third Anniversary badge. SpacePenguin earned the Fourth Anniversary badge. SpacePenguin earned the Fifth Anniversary badge. SpacePenguin earned the Sixth Anniversary badge. SpacePenguin earned the Seventh Anniversary badge. SpacePenguin earned the Eighth Anniversary badge. 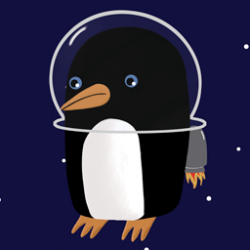 SpacePenguin was promoted to Member. SpacePenguin earned the Ninth Anniversary badge. SpacePenguin earned the Tenth Anniversary badge. After 10 years, the crumpet remains bitter.